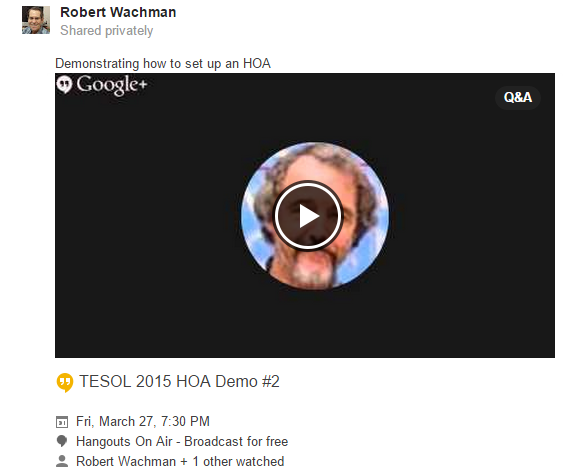 http://bit.ly/1EzyUG4 and again at 11:25 a.m. Robert Wachman conducts a Tech Fair presentation in the Electronic Village at TESOL 2015 in Toronto, on Google Hangouts On Air, including how to set up and launch one. The official invitations to these HOAs will be sent during the presentations as I cover that step. Thanks to Arturo who joined on his smart phone so we could have video and audio from the conference, since it wasn’t available on the computers in the Electronic Village. 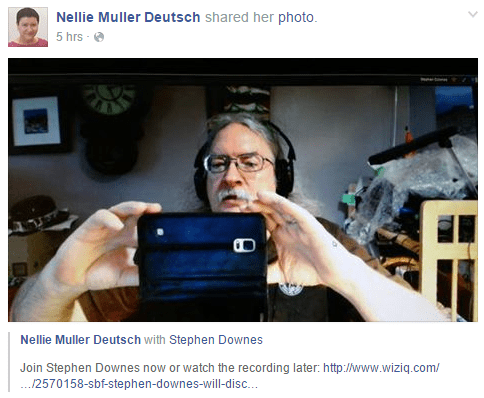 Not sure where the recording is. It might be appended to the recording above. 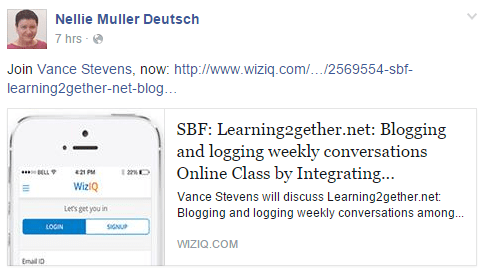 Learning2gether is an initiative of Vance Stevens evolving from synchronous meetings with Webheads in Action taking place weekly since 1998 and more directly from three WiAOC (WiA Online Convergences) in 2005, 2007, and 2009. L2g started in 2010 and has hosted conversations most weeks since, usually on Sundays (but for this occasion, on a Saturday). L2g encourages all educators who enjoy connecting with peers to volunteer to contribute their voices to perpetuating weekly conversations at our L2g venues. This presentation explains how L2g works and how you can contribute and participate. If you have taken the course already or even if you haven’t but are interested in taking a more active role, we are looking for Community Teaching Assistants to help lead the course! Finding ways to make online courses interactive and localize the content is what can make MOOCs successful. Read more about this opportunity in the Community TA Handbook. We don’t anticipate this taking more than 2 hours a week of your time. Nor will we be able to offer any ﬁnancial compensation, but we will gladly write a letter acknowledging your valuable role in this course. We work very closely with our CTAs to make both our roles more enjoyable. If you are interested in this opportunity, would you mind ﬁlling out this brief questionnaire so that we can contact you with further information. You’ll also have to register for this course. Another way to assist other teachers in your community is by setting up MOOC camps. These are face-to-face meetings held at least once a week during the course with anyone in your community taking the course. It’s a great way to discuss topics and assignments and brainstorm ways to apply new concepts to your local context. 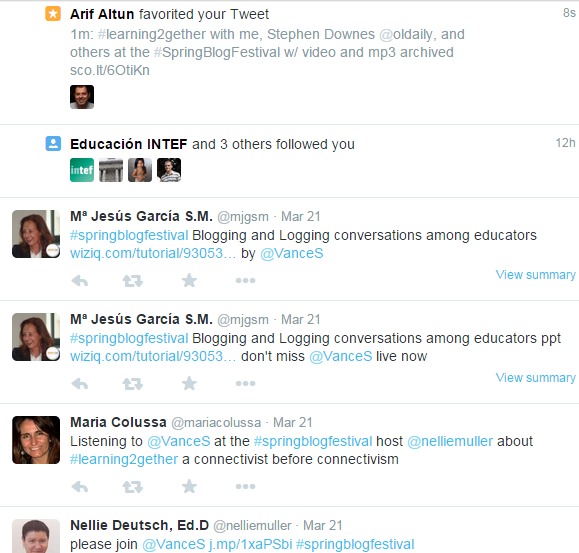 Feel free to organize MOOC camps with your colleagues! Journal Club at Infolit iSchool: Join the group in SL for a one-hour discussion of an open-access article. MARTIN, J.. Refreshing Information Literacy: Learning from Recent British Information Literacy Models. 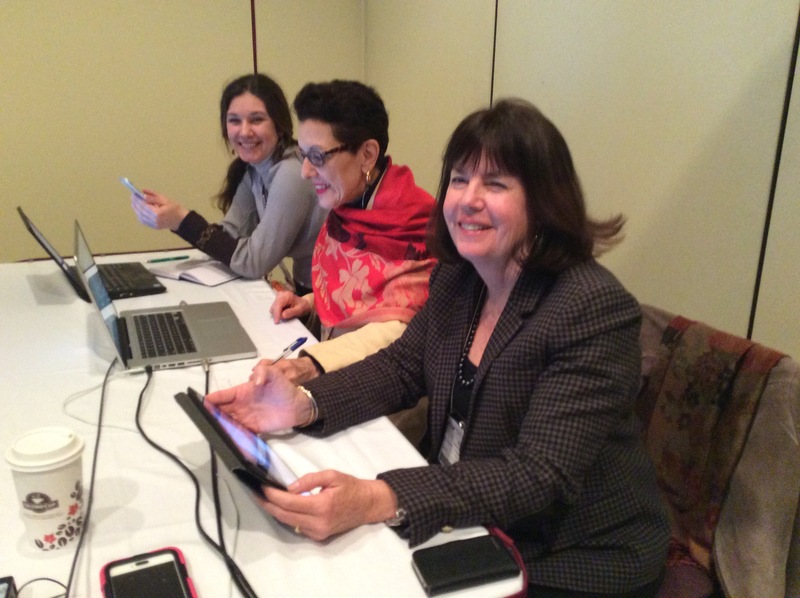 Communications in Information Literacy, North America, 7, dec. 2013. Everyone is welcome to join the one-hour discussion. This is a Sheffield iSchool Centre for Information Literacy Research event. Register for this complimentary webinar to learn how Dr. Colin Montpetit, Assistant Professor of Science Education at the University of Ottawa, increased class participation to 99%. Hear how he transformed his classroom into an “active learning zone” with the use of a student engagement solution. Get the full story behind Dr. Montpetit’s stunning findings – how student participation rates grew in his classes, grades improved and failure rates decreased. Who Should Attend: All are welcome. 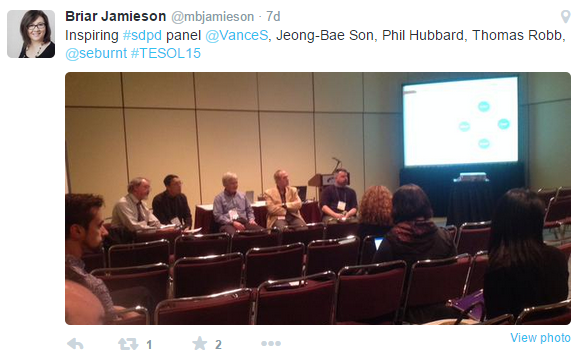 Those in Academic Technology or Teaching and Learning Centers are highly encouraged to attend. Not time-zone friendly? Register to receive the archive. Just another reminder that today we’ll be presenting the webinar Getting Started with Connected Learning and Global Collaboration at 4 Pacific/7 Eastern. Registration is free for members, just “buy” the product from our online store here to register. Check out the description below, and I hope to see you there! Join educators from across the world as they share global collaboration experiences K-12 and beyond and provide advice for what works and what doesn’t work. Topics include: where to go to find global partners; best collaborative tools to use; networks to join; ideas for curriculum development. This promises to be an energized and fun session for beginners as well as experienced global collaborators! 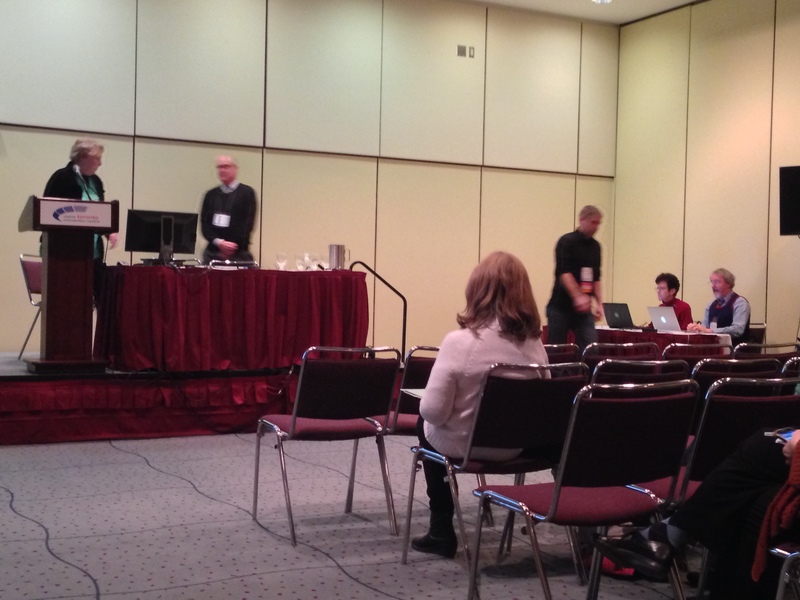 One of the presenters Vance shared his insights into using various apps for writing including Google Docs with students to both enhance and streamline the process of interacting with them in their writing practice. Vance teaches to students who use iPads but manages the process on a PC. We will discuss the reasons for this configuration, but my purpose at this session is in part to get feedback from those present on how they address writing with their students in an iPad or PC environment. 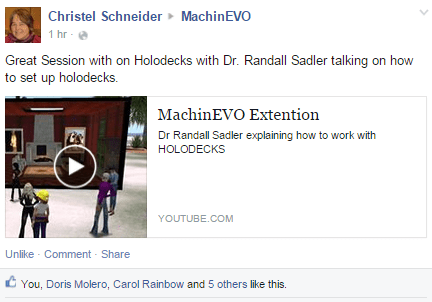 How can we increase the level of interactivity on our Moodle courses? 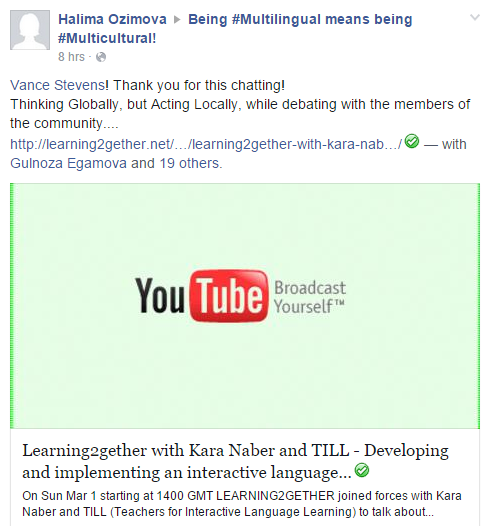 On Sunday Mar 08 at 1400 GMT Learning2gether held a discussion hosted by Elizabeth Anne on blended learning in her conservative higher ed environment in Grenoble, France. She focused largely on Pbworks Wiki <http://pbworks.com&gt; and how she uses it to post student writing and then correct it so that the posts have correct English, but the students can see from wiki history what changes were made. She then uses screen shots from the marked-up histories to show the class what errors were made in here grammar and writing lessons. The establishment is notoriously opposed to change. For the past 8 years my 3rd and 4th year science students have all had to create their own pbworks wikis for their English class (to fulfill the requirements of their mark), while each class shares a wiki on which they collaborate http://makeyourown.pbworks.com/. I’d love to share some of the things I’ve learnt from this experience while learning how you manage to reconcile blended learning with institutional requirements. TeachTechPlay is a monthly web-show where educators share a range of tools, ideas and lessons with the time limit of 4 minutes. The audience will then vote for the Play King or Queen. I’m a relatively new teacher. For the last three years, I’ve been teaching ESL to adults in an ABE program in the US. Recently I accepted a position teaching EFL at a state university in Oaxaca and am still awaiting my work permit. In the meantime, I’m trying to prepare myself for my new job. In addition to teaching face-to-face classes, they want me to develop a curriculum to teach via Interactive TV (ITV). I’ll try to explain the system. The university has one building entirely designed as a broadcast center. It has many small rooms that are set up with video cameras that broadcast classes live to other campuses in the state university system. One teacher will be teaching up to three classes in different locations simultaneously. The classes are designed so that the students and teacher can interact in real time. The broadcast rooms are set up with a desk for the teacher. Beside the desk is an interactive whiteboard that (as you know) can be used for a variety of things. The cameras are set up so that the teacher can focus on herself talking while sitting at the desk or standing at the whiteboard. One benefit will be that each remote classroom will have an assistant. That person can facilitate the class in different ways, for example by distributing materials or dividing the class into small groups for activities. The university is already using ITV for regular content courses, but they want me to develop a curriculum for teaching EFL. This is a completely new “ball game” for me, since my previous experience included technology no more sophisticated than an ‘old fashioned’ whiteboard with felt markers. All I know for sure is that it will be different from face to face classes. I would appreciate hearing from any of you who have had experience with this type of distance learning. What techniques work well for teaching language using both the ITV and interactive whiteboard? In a nutshell, the event went off as if we’d planned it that way, but what in fact happened was that Benjamin scheduled the Hangout on Air (HoA) for March 1 and created an event for it. However, an hour and a half before show time, which would have been very early Sunday morning for him in Mexico, he sent me word that he wouldn’t be able to make it due to a sudden illness (hopefully passed by now). Presumably he went back to bed to recover. Meanwhile some had turned up in the online comments spaces created for the event, where I posted my Skype address and the link to our synchronous text Chatwing. +Kara Naber is on Skype and I’m awaiting her response to my message there. +Robert Wachman has some materials lined up for us. Halima is in Chatwing and Morteza is on Skype awaiting a link. I’m posting at this event https://plus.google.com/u/0/events/cqh3kljq92gv1bgmeipkb680clo?authkey=CIytwo7QgJfv3AE and ready to start a new HoA. I’ll go ahead and do that and see what happens. Due to the inevitable tech-ups (hic) in trying to organize on such short notice we were a little late starting but when the HoA came online it had a half dozen participants and eventually filled to ten. Besides Kara and Robert, we had Glenys from France, Halima from Uzbekistan, Jim Buckingham from down the road in Abu Dhabi, Morteza Barin from Iran, Sabrina Wilson from Barcelona, David Weksler from Tenafly NJ, and Elizabeth Anne from Grenoble, not a bad crowd for what was essentially a flash mob. Had I had time to organize it I would have streamed it at http://webheadsinaction .org/live, so it’s possible we had to turn away some in excess of ten participants allowed in HoA. Joel Mills is holding open tutorials on Friday 13th February at 9.00 – 10.00 am GMT for anyone who wants to get some advice or support on any of their Minecraft projects. He will be using the Canvas conference tool again, but in a way that allows people to join in and ask their questions or get support. Look out for the conference email on Friday morning and follow the link to join in. For our participants from further afield we will hold a conference on Monday 23rd February at 5pm GMT so we can make sure they can join in live as well. The presenter will introduce a project in video format, then explain how the project evolved over the course of 20 hours. Nives Torresi has been Teaching English at High Schools and Elementary / Middle Schools in Italy for about 15 years. She also does translating, interpreting and training programs for local businesses. She enjoys what she does and tries to make learning a part of life. Get Them Speaking & Learning with Digital IcebreakersTransform your classes into collaborative supportive student communities with digital icebreakers. In this session, Shelly Terrell will share various digital and mobile icebreakers for young learners to adults. Join the fun and learn some quick activities that get students to take better selfies, collaborate on recreating images, and much more! 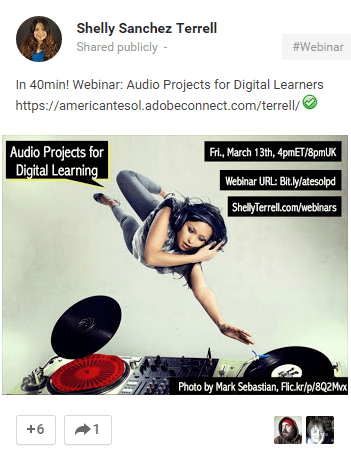 Shelly Sanchez Terrell is a teacher trainer, instructional designer, teacher, and the author of The 30 Goals Challenge for Teachers: Small Steps to Transform Your Teaching and Learning to Go: Lesson Ideas for Teaching with Mobile Devices, Cell Phones and BYOT. She has trained teachers and taught learners in over 25 countries and has consulted with organizations such as UNESCO Bangkok, The European Union aPLaNet Project, Cultura Iglesa of Brazil, the British Council in Tel Aviv, IATEFL Slovenia, and HUPE Croatia. She has been recognized by various entities, such as the ELTon Awards, The New York Times, the Ministry of Education in Spain, and Microsoft’s Heroes for Educationas a leader, innovator, and visionary in the movement of teacher driven professional development and education technology. Recently, she was named Woman of the Year 2014 by Star Jone’s National Association of Professional Women and awarded a Bammy Award as the co-founder of #Edchat, the Twitter chat that spurred over 400 teacher chats. She shares regularly via TeacherRebootCamp.com, Twitter (@ShellTerrell), Facebook.com/shellyterrell, and google.com/+ShellySanchezTerrell.